The Rotator Cuff consists of four separate muscles and their tendons. These muscles are responsible for raising the arm away from the body. The muscles of the rotator cuff are attached to thick tendons which cover the shoulder joint and insert into the head of the humerus. 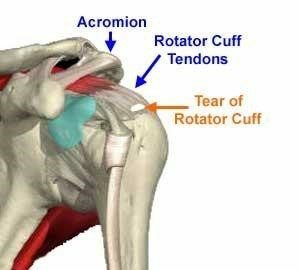 Tears of the rotator cuff are more common among middle aged and older patients. Tears may be caused by a traumatic episode , by a slow wearing down due to direct pressure of the acromion grinding upon the rotator cuff tendons, or by a slow loss of blood supply to the tendon. This repeated pressure upon the tendons is called Shoulder Impingement. Tears of the cuff can range from minor partial thickness tears to complete tears which require surgery. Complete tears will not heal without surgery due to constant tension on the tear and poor blood supply. The most severe tears of the rotator cuff may not be surgically repairable . Surgery is performed under general anaesthetic. Through two small incisions the fibre-optic telescope is inserted into the joint and the joint inspected . Using special instruments a subacromial decompression is perfomed to remove any impingement. Following this the scope is removed and one of the incisions is widened to allow repair and reattachment of the tendon back to bone. This is normally achieved using a series of small anchors or drill holes through the bone. If the te ar is very small it can be reapaired arthrosciopically. In most situations your tear will be repaired using the open technique. Whilst this does lead to a slightly bigger scar, the recovery is very similar to an arthroscopic repair. This includes post operative pain, time in hospital, rate of healing , time in a sling and so forth. Tendon healing is a slow process. It takes 6 weeks before it is safe to start moving the arm under its own power. It is nearly 4 months for the tendon to heal fully into bone. 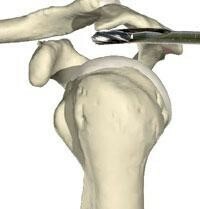 Most patients are very happy with their shoulder surgery in terms of reduction in pain and improvement of function. 90-95 % of patients have a significant reduction in pain and improvement in function. The failure rate for the actual cuff repair is high., Up to 50 % of people depending on the type of tear and their age will retear the cuff or the repair will fail. Despite this these people usually still feel much improved, and the majority have only minor pain. – Stiffness : all patients initially are stiff, this usually resolves with time and exercises. !0% of patients develop some degreee of frozen shoulder. Approx. 5% of patients are left with residual stiffness. – Weakness : Most patients never regain full strength. This is dependant upon the patient age and type of tear. – Pain is common early on , this usually settles with time. – Wound ooze : during the procedure the shoulder is pumped full of fluid. This often leaks out over the next 24 hrs. – Retear is very common either due to reinjury or the tendon not healing in the first instance . It the tendon is degenerate and has poor blood supply often healing can be incomplete, or fail early. Overall the risk of the surgery making your shoulder worse is less than 2%. You will wake up in the ward in a sling. You will be given adequate pain killers to help control your pain. The day after surgery a waterproof dressing will be placed on the shoulder and you will be allowed to shower. When showering take the sling off but leave your arm adjacent to your body. It is important to sit out of bed and walk around as soon as you are comfortable and able. The day after the operation you will be reviewed by the physiotherapist on the ward Normally you will be able to go home the day following surgery. On discharge from hospital you will be given oral analgesics and advice on exercises. About 10 14 days following surgery you will have an appointment to see Dr Hewitt to review your wound and progress. You will again be reviewed at 8 weeks. Which will be about 2 weeks after removing the sling. Sleeping: Sleeping can be uncomfortable if you try and lie on the operated arm. We recommend that you lie on your back or on the opposite side. Ordinary pillows can be used to give you comfort and support. Driving: You can not drive with a sling therefore 6 weeks. Working: Job dependant, office work 4-5 days. No heavy labor for 3 months. Sport: If rehab progresses well, 3 months. This protocol applies to most cases , some variations will occur depending on the injury and surgery. If you have any questions about the surgery or rehabilitation dont hesitate to ask Dr Hewitt. To download and keep this information, see the PDF here.